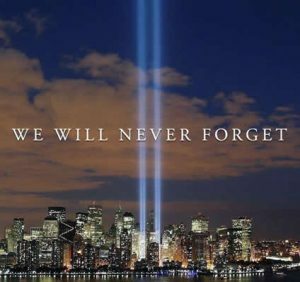 It has been 16 years since 19 jihadis from Saudi Arabia flew airplanes into the Twin Towers in New York, the Pentagon in Arlington, Virginia, and tried to reach the U.S. Capitol in Washington, D.C. but failed because of the heroic efforts of American citizens. Since that day, America has fought and lost two wars in Afghanistan and Iraq, not because of a failure of Marines, soldiers, sailors, or airmen, but because American political and military leaders failed to do their legal duty to KNOW the enemy. Since that day, many American pastors and rabbis have misinformed their flocks and told them the god of Islam – allah – is the same as the God of Israel and the Father of Jesus the Christ of Nazareth. Since that day, U.S. government analysts across the board have attempted to identify the threat without including Islam in the analysis because Presidents Clinton, Bush, and Obama told them the threat comes from “Violent Extremism” not from Islam. Since that day, many American citizens have come to understand the core doctrine of Islam – sharia (Islamic Law) – commands muslims to wage jihad (warfare) until the entire world is under Islamic rule. Americans are realizing Al Qaeda, ISIS, the Muslim Brotherhood/Hamas, Iran, Saudi Arabia, other Islamic nations and jihadi groups as well as the pinnacle of Islamic jurisprudence – Al Azhar (Egypt) – are all correct in their doctrinal understanding of Islam. Americans are also coming to realize their leaders are catastrophically clueless about this enemy. Sixteen years after 9/11/01, the United States government has not identified the threat nor the enemy threat doctrine (sharia), and has no coherent strategy for victory. If we want to honor the nearly 3,000 Americans who perished on 9/11/01 and all of the servicemen and women killed and wounded in combat, we must not rest until our leaders at the local, state, and federal level do their duty to protect America against “all enemies foreign and domestic” and identify and obliterate the jihadi network in the United States, and all of those Aiding and Abetting them. All over the world, muslims are making non-muslim suffer. And all over the world, the insane non-muslims are protecting muslims though their own laws, through their own constitution, and through their own principles of – No-discrimination, equal rights and religious freedom. And muslims have been given complete and unrestrained liberty to practice and grow islam inside non-muslims nations. This phenomenon exhibited by non-muslims universally, falls into the category of anti-survival. From an evolutionary perspective therefore, non-muslim civilizations are not worthy of survival, and deserve to fall to islam, the followers of which, are pro-survival.